Montgomery County has over two hundred years of historic people, places and events that deserve recognition. Meanwhile, new streets and neighborhoods are being laid across the county as it grows, and they need names. Why can't we think of more creative titles for them? The new development will include a new street between Ripley and Bonifant streets. TBD suggested it would be called "Ripifant," a portmanteau of the two streets that left a few people, including myself, scratching their heads. Though County Councilmember George Leventhal says that it'll just be called Ripley Street, I started thinking about how we name places and streets in Montgomery County. Often, you can tell how old a place is by what things are named after and how meaningful they are. A map of Montgomery County reads like a history textbook: Generals Sherman, Lee and Grant have avenues named after them in Takoma Park, which was first laid out after the Civil War. In the 1930's, we named the county's first regional high schools for Lincoln's postmaster general and a Revolutionary War hero. Even minor figures, like businessman William Thayer, were memorialized in street names. 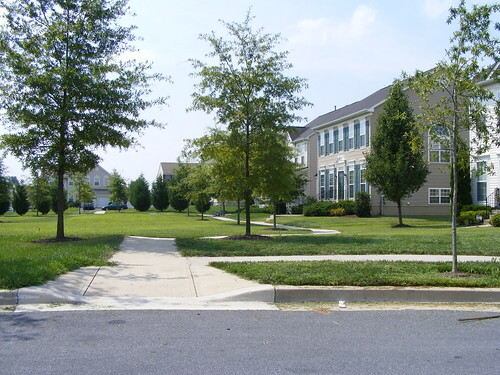 Meanwhile, in the five-year-old subdivision of Woodcliffe Park in Germantown, you can go to the corner of Northern Dancer Lane and Dark Star Way. In Clarksburg Town Center, still under construction, Granite Rock Road crosses Rainbow Arch Lane. And in Poplar Run, a new development at the former Indian Spring Country Club in Layhill that hasn't even opened yet, there's a Moonlight Trail Drive and Autumn Sage Lane. Does this street in Germantown look like a Bright Plume Terrace to you? These names are sweet and poetic, but what do they really mean? 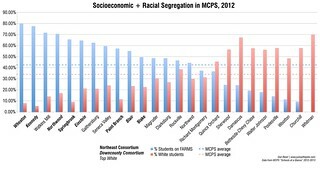 Do they actually have any significance to the communities they're located in? Street names in the planned community of Columbia don't always have a local tie, as entire neighborhoods have street names derived from Shakespeare's plays, for instance. But having themed street names can result in a memorable place, even if they can be embarrassing to the people living on, say, Satan Wood Drive. It doesn't have to be this way. 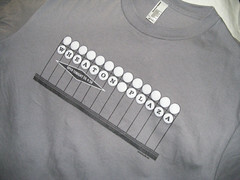 Names should reflect the people, events and history of the places they serve. 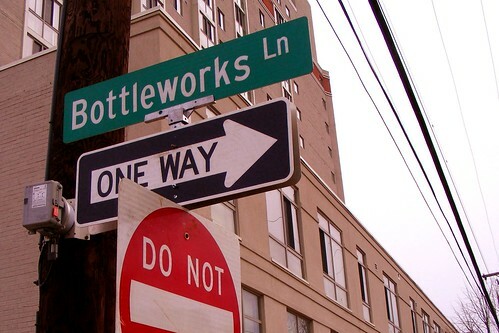 A few blocks from Silver Spring's Ripley District is a new street called Bottleworks Lane, named for the former Canada Dry bottling plant nearby. And in the Tanterra neighborhood of Olney there's a street called Considine Drive. It's named after Andy Considine, a former cop who walked the streets around the Park and Planning Commission in Silver Spring during the 1970's. Andy was my driving instructor in high school, and one day during my on-road lesson he directed me to the street named for him. "A builder came in with a plan for a subdivision, but he didn't have names for all the streets," he told me. "So one of the planners said, why don't we just name it after Andy?" It's a small gesture, but one that gives a place added significance and character. 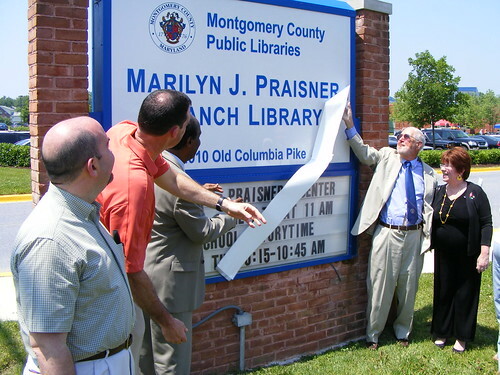 Re-dedicating the Praisner Library in Burtonsville in 2008. We already do that with the naming of parks and some public buildings. After County Councilmember Marilyn Praisner passed away two years ago, we named a library and recreation center after her. She helped get them built and funded, and now every kid who reads a book or plays basketball in East County will know who she is. There's a playground in Kensington dedicated to recently-passed civic activist Wayne Goldstein and a park in downtown Silver Spring for current Planning Board Chairman Royce Hanson - dedicated after he retired the first time thirty years ago. There's no shortage of potential namesakes for the Ripifant Streets and Moonlight Trail Drives of Montgomery County. Instead of going with a derivative name, we should pick one that commemorates our local history and heritage. Otherwise, we stand to lose them amidst a word salad of place names that could be anywhere else. Historically related names are often good idea. Woodside Park, was developed from Crosby S. Noyes' "Alton Farm" estate. Noyes was the editor of the Washington Evening Star newspaper in the late 1800s and early 1900s and a major civic leader in Washington. The Noyes Childrens Library in Kensington was named after him. Woodside Park has Alton Parkway, Crosby Road, and Noyes Drive, all named after Noyes or the estate. But we have to be careful when naming things after people. Sometimes we do it too soon, before the person was discovered to be a scoundrel. I think it would be better if we didn't name anything after anyone who hasn't been dead for at least 25 years. In Gaithersburg, they name streets with Star Trek references. I hope they don't name that street "Ripifant!" I like the ones named after actual people, like Dr Bird Road out in Olney. I used to live near a road in south Louisiana called Old Trashpile Road. There were perfectly nice houses on that road. I always wondered if there was a New Trashpile Road somewhere nearby. Yes, when I see the names I get it that I'm in Croom but it makes it a challenge getting directions right the first few times you visit. Any idea where all the castle references in Burtonsville come from? Greencastle Lakes, Greencastle Road, Castle Estates, Castle Blvd., to name a few. I don't know for sure, but much of the area was originally a country club (Greencastle Country Club?) hence all of the "castle" names. My friend who grew up off of Wexhall Road said she'd find old golf balls in the pond behind her house. It's also why the street system is so disjointed - when Castle Boulevard was first laid out in the 1960s, it was surrounded on three sides by the country club, so they made it a cul-de-sac, much to the chagrin of drivers and bus riders alike forty years later.